Another Aussie Christmas offering this week. There’s a few very Aussie words in this one, so it will be interesting to see if it’s understandable to my Northern hemisphere poetry friends. Let me know if there’s anything you don’t get! when it is Christmas here below. it’s time for sun and surf and sand. and summer treats are in demand. Hard work for reindeer in this heat. would surely leave them feeling beat. he’d soon feel overdressed a touch. is not going to impress him much. from Sydney town to Iron Knob. a new outfit, from head to toe. would seem to be the way to go. for Christmas songs that sound real nice. So ripper, bonza, beudy, strewth! to sing a song that tells the truth. This week’s Poetry Friday roundup is being hosted by Steps and Staircases. Head over there to see what other poetry goodness is on offer this week. 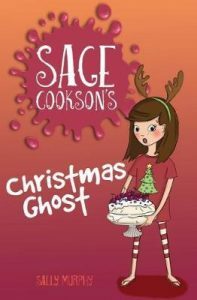 Also, if you are looking for a quick Christmas craft activity, you can help your children make a a pair of Christmas antlers just like those Sage Cookson wears on the copy of my latest book. You can find printable pages, and instructions here. Your song paints a picture, for sure! Thank you for sharing what it’s like in warmer weather, in Australia– sounds like a lot of fun! Thank you for sharing the printable, Sally. Thanks Lisa And thanks for hosting this week. Okay, you did mention roos… maybe that’s partial credit. LOL. Oh, and congrats on your latest book too! Sadly, the ‘six white boomers’ song has been tarnished for me because Rolf Harris, the song writer and performer, has been brought into disrepute. But yes, the thought of using kangarooos instead of reindeer remains. What fun and congrats on your new book!! Looks very fun. I wondered what “Iron Knob” was. And I briefly pictured St. Nick in a different kind of thong also, but luckily, it passed away quickly. LOL As for “ripper, bonza, beudy” not a clue! Thanks Brenda. iron Knob is the name of a town. Aussie sense of humour I guess – I haven’t researched the name of the town, but I’ve been there, and I’m guessing the ‘knob’ part has to do with the hills. The last three are superlatives. What fun to read your Aussie Christmas poem! Reading through the comments cleared up some of the unfamiliar expressions. I did have a fleeting (scarring?) mental image of Santa in a different type of thong before I realized you meant flip flops. Ack! Thanks for sharing and have a wonderful Aussie-style holiday! Ohmygosh, I love it! We are a pretty snow-centric Christmas culture where I live. It’s amazing how much we spread cheap plastic and paper holiday hoo-hah around the world to even warm places. What I would GIVE to spend a Christmas in Australia! Oh, I’d love to visit. The lyrics to this song are super. I laughed out loud at the thought of roos as santa’s helpers. But the ARE equipped with the proper pockets. I think you’ve got a great children’s book on your hands here. Somehow “this” comment ended up on Kat’s post. Here is what I wanted to say. Thanks for that ‘antler’ craft, Sally. I’ll share with my granddaughters! The poem is wonderful, though I can guess what these (So ripper, bonza, beudy, strewth) mean, I will ask. They are all superlatives for “terrific”-right? I’ve had family in southern parts of the US who have laughed at us all bundled up for the holidays. Now you too must ‘re-dress’ Santa! Love it! Thanks Linda. Love to see the antlers complete: I haven’t yet had a chance to make a pair myself. Love this, too – a very different Christmas from what we have in the American North East … but Christmas, nonetheless! Thanks Tara. yes, definitely still Christmas. Wonderfully fun! I agree with Matt it would make a great song. And keep those rheindeer off the roof. Thanks for sharing your poem and book too, Cheers! What fun! Utes is the one that confused me. Love it, though! Thanks Laura. A ute is what I think you would call a pick up. It’s short for utility. Maybe I didn’t quite get all the Aussie terms, but I think I got enough to get the gist. We’re preparing for the first snow, so the sun and sand and surf sound quite delightful, too. Love the book cover! Thanks Kay. I’ll send you some warmth. Love this! I can definitely see Santa in shorts, tank top, and flip flops (yes, I do get most of the references! )…although I think there needs to be a song about a Christmas python, don’t you think? Thanks Matt. We had a dugite one Christmas – they’re one of Australia’s most poisonous snakes. Pythons I could cope with. Thanks for being ridgy didge with us, Sally! The cover of your book looks great! We had buddies in Australia one year and my 6 year olds were fascinated with the making of “sand angels” instead of “snow angels”! For warmed up Santa to doff. So clever Donna! Thanks for contributing.